In July 2017, a Suntrust Mortgage survey revealed that millennials were finally buying homes-- but for a surprising reason. While generations before bought property to invest or house a growing family, Generation Y buys houses to have enough space for their dogs. But it’s not just younger people who yearn for a more pet-friendly lifestyle. Baby Boomers spend an estimated $60 billion on their pets a year. Young and old, people love their pooches. 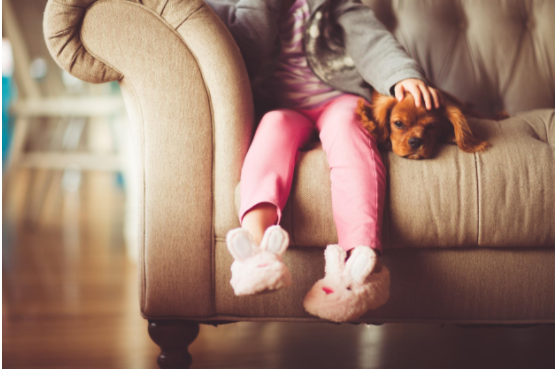 If you’re one of the 44% of Americans that own a dog, you may be interested in making your home more hospitable for your four-legged friend. These two easy and inexpensive projects are a great way to make your canine feel more at home. which should work for most indoor needs. Measure one furring board into halves twice and mark with a pencil. Using a circular saw, cut the furring board in half to make two 4 ft boards-- these are your frame boards. Sand any rough edges as you go. Lay plywood sheet on a flat surface and place frame boards on top, 12” apart. Using your pencil, mark the length and width of the frame. Using your circular saw, cut the plywood section according to these measurements. This is the top of your ramp, so make sure the cuts are accurate. Cut 12” lengths from the remaining furring board for the steps of your ramp. Line them up 6” apart down the ramp and nail them down securely. Hammer the nails all the way down into the wood to prevent your dog from injury. Sand down all the surfaces of your wooden ramp before painting. Painting will not only make it more aesthetically pleasing; it will also keep it from rotting or warping as time goes on. Once the paint is dry, your dog’s new ramp is ready! Set it up against the couch, the bed, or any other area he may need assistance getting up on. This project is a double hitter-- not only do you get a cute, elevated stand for your dog’s food and water bowls, it also comes with storage where you can put his food, treats, and toys! Trace the circumference of your bowls on the top of the shelf equal distance apart. Measure ¾” in from the perimeter of each circle and use your compass to draw another circle inside. Using the jigsaw, cut the inner circle out of the top of the shelves. The goal is to have holes just slightly smaller than the bowls so they can fit in but stay put with their lips. Sand down the wooden shelf. Paint or stain the wood depending on your preference. Once the shelf is dry you can set it up wherever you feed your dog. Place food, toys, etc in the baskets and store them in each cubby. Place metal bowls in the top holes and fill with food and water as needed. Your dog is part of your family, so make your home safe and pleasant for him! These easy, inexpensive DIY projects are perfect for helping your dog stay mobile and keeping his food and toys organized. Each one can be customized to fit your home decor needs, so use your imagination!